The next iteration of this year’s NHL Draft Scout Series takes us to the Western Canada and the WHL and company. Usually, we just focus on just the WHL, but this year a defenceman from the AJHL’s Brooks Bandits has forced us to expand our range to include Junior A hockey, as well. FutureConsiderations Head Western Scout Justin Froese was kind enough to join us to explain why Cale Makar is someone to be excited about, and an all around look at what Western Canada has to offer for the 2017 NHL Draft. Christian: The WHL has lacked that rankings topper star prospect for a few drafts now, but appears to be back with Nolan Patrick. Aside from Patrick, there are a few other top flight WHL prospects in this draft as well. How would you rate this WHL class in a draft dubbed by many as “weak”? Justin: I think that the notion this draft was weaker started to be floated mid-season by the mainstream media and there was mass buy in to that label on all levels. Although there may not be a generational type talent like McDavid or Matthews to be the slam dunk guy later this month, talent is in the eye of the beholder and there are a lot of great options not only on day one, but even in the mid to later rounds of the draft. The other factor that could fuel the stigma is that there has really never been this kind of parity in a draft crop prior. 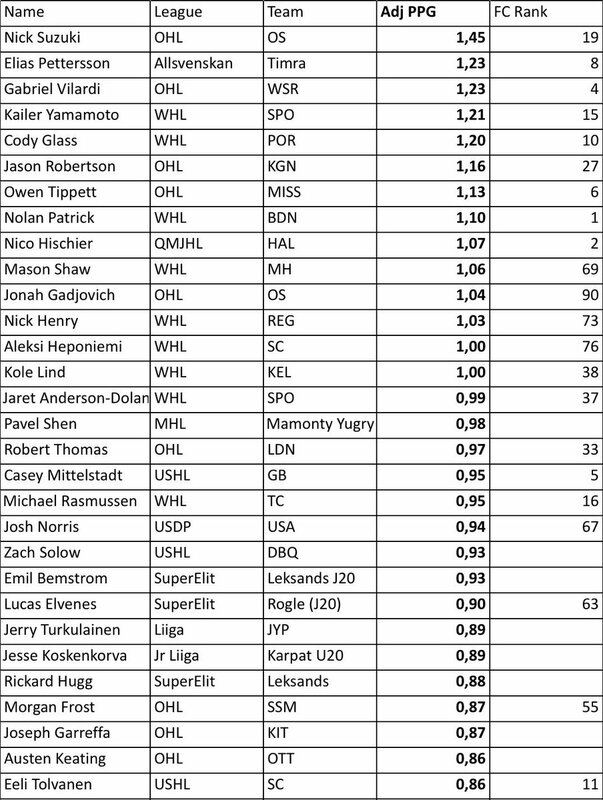 Looking abroad, there has been little consensus outside of the top two players as I get the feel anyone ranked 3-15 could be argued to go in any particular order based on what each team has assessed in the field and values as an organization. This isn’t a typical 3-4 horse race at a particular juncture as we have seen in past years and after your top couple of tiers, the draft order is wide open. Judging my region’s talent this past year, I feel that the WHL and Western Canada rebounded in a big way and has some big cards in play on draft day. The WHL presence will begin early and often on day one, with as many as 11 skaters who have a shot at the first round. The overall depth isn’t shabby either as there’s a strong mix of mid-tier skaters, goaltending projects and overagers who could provide value at any stage. I have 42 players on my personal list from the league that I believe are likely draft targets and it could be argued that if other groups are weaker, a few more could join that list. Although deemed inferior, I don’t think this is a class to disregard as we will not see how the group develops for another 3-5 years. C: Speaking of Patrick, many still consider him to be the top prospect in this draft class, but injuries have kept him from effectively defending that title. How do you evaluate Patrick and do you see in him star or first line centre potential? J: For me, and I have been adamant about it all along, I still believe Patrick is the top option for the first overall pick. Having seen him for parts of four years now I feel that he does so many little underrated things that affect the game and elevate his team to a higher level. Coming into this year a lot of people evaluated the offensive side of his game that basically vaulted him to distinguished title of potentially being the draft’s top prospect. Patrick has made his mark by being a smooth player who can play a heavy possessive game and seemingly dictate puck movement without radiating prior intent. His IQ is his calling card and you know that he is on the ice because he is often the centrifugal force who affects the outcome of events. This season, despite being segmented and often not going according to plan, Patrick played heavy minutes on a team devoid of the depth he previously enjoyed. Leading an offensively-starved lineup Patrick was heavily leaned on to provide all the key qualities of leadership and play focal minutes at 5 on 5 and in situational play. Defensively he picked up the slack while also providing a physical element. These were prime areas of his game that grew and answered questions about his drive and two-way game. The way Patrick plays is more of a pro-style game that is geared towards consistently smart hockey plays, efficiency and the ability to force his will. He’s not a player who will flaunt that “Harlem Globetrotter” type skillset on a regular basis but he has the cunning and ability to make opponents look foolish as he so chooses. Number one centers come in many forms depending on what organization you look at. Is he a Sidney Crosby or a Connor McDavid? No, because no one else is either. But who is to say that he cannot affect the game like an Anze Kopitar, Ryan Getzlaf or Jonathan Toews do with their respective teams? While not comparing apples to apples with these lofty names, my belief is that he has the intangibles to be his own unique player but affect his organization in a similar manner to the latter group of players. Not saying it will happen overnight for him, but he is smart enough and talented enough to be the malleable piece a team can build around. C: Cody Glass has ascended in many people’s rankings throughout the season, to the point where he’s being discussed as an option as high as fifth overall to Vancouver. Some feel Glass isn’t dynamic or skilled enough to translate his 90+ points this year in Portland to the NHL. Where do you stand on Glass and do you see his offense translating to the professional level? J: Glass is an interesting case and one of the best stories out of the league this year. Watching the Hlinka camp early on he was a guy who looked to simply just blend in with the crowd and got overshadowed by the other skill guys. Heading back to Portland, I honestly didn’t see an ascension to this degree occurring. To me Glass is a raw kid who has come a long way in under a calendar year. He has a great mind for the game and loves to distribute the puck, as his passing game is one of his strongest attributes. Although having some issues still with his starts, he keeps pace with his skating and remains shifty enough to get glimpses of free ice to execute on the play. I think that he has the ground work to develop into a two-way player, showing improvements in the subtle aspects of defending and physical play. He’s going to grow and add the durability portion to his game that will allow for him to add that lauded blue collar element. As far as point production compares, I have gone on record to compare the style and development curve to Mark Scheifele, a kid who needs time to be nurtured and adapt his game, but could be an impact player in 3-4 years. Obviously there are extrinsic factors that may affect Glass’ development but we could see a kid who turns out to be one of the more steady producers if he is in the right environment. C: Juuso Valimaki seems like the top WHL defenceman in this draft, but only slots in 12th on FutureConsiderations’ rankings for the 2017 NHL Draft. Valimaki is 6’2, 205 lbs. and scored 61 points in 60 games, a remarkable total. How do you see Valimaki and why isn’t he more well regarded considering both his size and scoring totals? J: Valimaki was impressive this year and he very well could be one of those guys who sneaks into the top 10 if someone likes the stability he brings to the table. He has great tangibles, possesses a durable frame and has a great brain for the game. I think where some guys balk on ranking him higher is his skating, especially his pivots which lead to lapses in his ability to defend. Obviously, being a skill that has correctable qualities, it’s unfortunate to see him sewered by some agencies, because I believe it’s not going to be a huge concern in a year or two. That being said, despite the promising numbers, I don’t see him being in the mold of a dynamic defender, but more of a heady passer who is thinking a zone ahead and knows how to transition the puck without throwing in the towel defensively. He skates the puck a lot in junior now, but I think he will learn to play a bit more conservative going forward and round his game into a more physical two-way upside defender. There’s lots of room for guys like him in the game and I do love the skills he brings, some of the other defenders just may be viewed as higher ceiling players. C: Michael Rasmussen seems a pretty polarizing figure, some ranking him top five, others dropping him from the top 20 entirely. He scored 55 points in 50 games with Valimaki in Tri-City, but was just seventh in team scoring. Are you a fan of Rasmussen and why do you think opinion is so split on him? J: If you want me to be bluntly honest on Rasmussen, I was one of the guys at our firm who vetoed the top 10 talk and it was the drum I beat on from my first viewing of him right up until he was done for the season. While he does possess a lot of great qualities, in ranking talks there’s still a hint of pack mentality – AKA, the group who overlooks the deficiencies when size and skill enter the equation. He’s a large framed player who skates well for his size, plays a strong passing game who can utilize his hands in motion or around the net. For me though, as an evaluator who prioritizes hockey sense, I find him as a guy who is relatively average in this category. He’s a guy who needs a lot of space to manufacture plays and often does more blending than leading, especially when playing an even strength game. I don’t believe on putting a huge emphasis on statistics when projecting the players, but putting up 32 goals is an impressive feat for any draft-eligible junior player. That is, until you break it down. Rasmussen’s 5 on 5 production accounted for only 43.64% (16 goals and eight assists) of his total output, meaning he does a tonne of his dirty work on the powerplay, and not so much when he doesn’t have an advantage. When ranking a skater, especially in your top tier of forwards, I believe you are looking for the player who has the most upside to help you not only in a complete manner, but who has a higher potential to contribute offensively. While he does have the work ethic and tools, I have a feeling he will be more of a bystander than a focal producer. I do still think he is a decent top 20 candidate and a good bet to play as a pro, but more so as a two-way, net front presence who can dominate for stretches, but not consistently. I believe by going all in on him early, some teams are selling the quality of this draft at the top end short. C: Kailer Yamamoto on the other hand seems consistently ranked in bottom half of the second round despite back-to-back dynamite scoring seasons in the Dub, including being the top scoring draft eligible this year, period. Is his 5’8, 155 lb. stature really that big of a detractor to what seems like elite skill? J: Unfortunately, you can likely look at the other end of the Rasmussen spectrum and find Yamamoto, chomping at the bit to prove naysayers wrong. There’s no doubt about it, this kid is in tough to prove himself as a professional but if anyone of his stature can pull it off, I believe it’s him. Yamamoto is one of the most highly skilled and intelligent skaters in the class and if he were a little bit bigger, he would likely be a slam dunk top 10 guy on draft day. He’s figured out how to adapt and survive over his three junior seasons thanks to his high-end skating ability, puck skill and concise decision making which helps him remain elusive and avoid being pulverized. Even though he is rather ineffective physically in man coverage, the kid is a gamer, possessing a high-end compete streak and strong mental game which is a huge plus when the odds are against you. He has figured out the nuances in how he must play his game, and now he must simply prove himself at a higher level. C: Which WHL draft eligible has been your biggest surprise this season? J: Going to the overage pool, Morgan Geekie came essentially out of no man’s land to join the draft discussion. A big lanky prairie kid, Geekie is an offensive talent who has great reach, picks his spots well and is equally strong at distributing and putting pucks in the net. While not yet developed into a strong two-way option, he knows how to play to his strengths and work through his shifts to avoid being a detrimental player on the ice physically and defensively. There’s a ton of raw talent here and knowing the bloodlines and acquaintances assure me he’s a gamer who is working his tail off on and off the ice to continuously improve. Listed at 6’2 and 177 lbs. during the season, Geekie was weighed in at the draft combine once again, only this time at a significant 190.48 lbs. For a kid who has earned rave reviews for his excellent puck skill and great hockey sense as a sophomore, this weight gain may be the golden ticket for the same player who was also scrutinized for having hollow legs and poor skating ability. If a player with his ability puts in the effort to improve their on ice performance, this may very well be one of the best late bloomers in the draft. He’s also a two-sport athlete who had an opportunity to pursue baseball at a division one school, but it looks as though he chose a good path. C: Who has been your biggest disappointment? J: There’s a few names that could be put in this category but I’d have to point out the post-trade regression of Nikita Popugaev. The big, 6’6 Russian has spurts of brilliance offensively, but looked to me as though he was a guy who was more lenient on his teammates than being a consistent presence. He is a raw skater who struggles with balance and pivots but isn’t limited in the rush game, as he can overwhelm in full flight. His top gear coupled with his skilled hands, vision and passing ability makes him a threat with the puck on his stick and also when he finds a soft spot to pound the puck on net. He is capable of putting together high-end sequences, but I found there to be far too much inconsistency in his game. Since he has entered the league with Moose Jaw and since moved onto Prince George, I have witnessed this disappearing act for shifts on end where he fails to compete for pucks and looks devoid of defensive prowess. For a guy of his size he is not one to take the body and although only slightly disproportioned between weight and height, strength looks to be an issue even when matched up against his peers. Although showing that he has the tools to succeed, the questions of whether he will translate to the pro game goes beyond his developing skillset. I had hoped to see an improvement in his drive this year, but instead he tailed off and finished the year like a kitten. Mark Rubinchik and Nolan Kneen are also honorable mentions in this category for me. Rubinchik was a highly regarded import, much like Popugaev, but couldn’t piece together the elements to his game on a consistent basis or provide the impact as a two-way defender with the Blades. I thought highly of him in his pre-draft year in international competition, but his game must only be something he can pull off when he pulls his country’s jersey over his head. Kneen on the other hand was a high bantam pick who at one time was highly regarded but has plateaued in his development. Showing minimal offensive instinct and wavering defensive awareness, neither looks good on a player who is geared towards being a shutdown player but is a master of none. C: If you had to choose a most overrated and most underrated WHL prospect for this year’s draft, who would they be? J: My overrated skater out of the WHL would have to be Cal Foote of the Kelowna Rockets. On the surface, this is a kid who seemingly has it all: Size, lofty statistics, professional pedigree and a vital role in his club’s success. While he looked really solid in many viewings, I personally thought that he failed to show gumption and didn’t push the tempo of the game unless he was forced. Outside of the conservative style, I thought there was some laziness issues when moving the puck and he showed some leisurely issues in his own end. I’m not saying Foote won’t be a player as a pro, as he has a good base to develop from, I just don’t buy into the idea a high-end two-way guy is there. Personally, if I’m a top 20 team, a guy who has limited upside isn’t on my board that early, no matter how they’ve faired on the score sheet in junior. I see him as more of a mid-pair defender who could be a good shutdown guy if he improves his physicality and skating, fine if that’s what you’re looking for, but there are better options earlier. Flipping the script, my underrated player of the year is Jake Leschyshyn of the Regina Pats. This kid improved a lot from his rookie year and really impressed me with his versatility on a deep team. Leschyshyn’s offensive skillset and two-way prowess allowed him the ability to pencil anywhere in the lineup and approach with a demeanor that impacted the team. His skating ability and offensive skillset progressed and even though not physically large, he was the type of kid who would skate through a wall to make an impact. While I don’t see him as a top-end scorer, a good middle six player who can make and finish plays or help protect a lead is nothing to shrug your shoulders about. He was sorely missed for Regina down the stretch and in their playoff run, as they lost a key cog to lift some heavy minutes for them. He will be a centerpiece for the Memorial Cup hosts in 2018. C: Lastly, who’s your favourite Western draft eligible and why? J: We’ve already mentioned Nolan Patrick above on this list, so I’m going to go with my number two ranked player, Cale Makar of the Brooks Bandits. Makar plays arguably the most exciting game in the draft, and plays with a dizzying amount of energy. He has high-end pucks skills and a fluid skating style. The combination of skills, coupled with his intelligence makes him a constant threat to jump in on the attack. He’s a player who is hard to predict if you’re a defender or a spectator, but for some reason, he seems to have an ability to be cohesive with teammates and is impossible to comprehensively defend. At this time the general knock on him would be that he hasn’t had to defend competition at a high level. I think there’s growth opportunity, but I don’t see it as a huge concern as I found him to be among the most impressive players at the World Jr. A challenge as he matched up against some of his top tier peers when he captained Team Canada West. I believe that he has nothing left to prove in the circuit he is in now, but will be given a healthy test as a freshman next season at UMass. He needs to learn to landmark defensively and calculate risk once he makes the jump, but has the potential to be an absolute stud as a professional. He’s been a huge riser and a wild card that you can expect to see come off the board early and add a huge boost to a team’s defensive group. The only thing that worries me about Yamamoto is his birth date. He’s only 5 months younger than Matthew Phillips, who was only 9 points behind him. Was Phillips just that good a pick? For comparison sake, Nick Suzuki is almost a full year younger than Yamamoto. Unless I’m mistaken, Yamamoto had the highest age-adjusted NHLe out of all draft eligible forwards, including Patrick and Hischier. So I guess… Matthew Phillips is just that good a pick. Geekie seems a good pick to me. Not sure at #16 – everyone would take Suzuki I suppose, at #16 – but Geekie looks to be a good pick. So would Lind.